When you load the Antibacterial Spectra of Activity for the first time, you are presented with a default view containing a small subset of data. Not to worry, as you customize the table, your changes will become the default view. This customized view, created by you, will be available each time you revisit the table. Please note that in order to accommodate users with older devices, we currently reset the default view back to our initial data set if the custom view contains more than 2,000 interactions. The goal is to ensure that users do not build a default view so large that it hinders their ability to use the table. 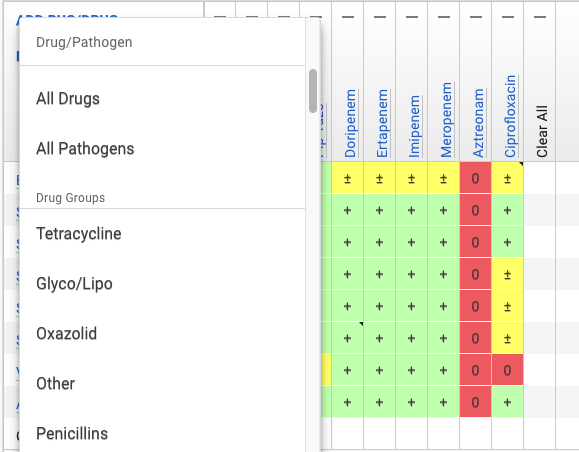 Adding an anti-infective or a pathogen can be done by clicking the "Add Pathogen/Drug" button (shown within a red box in the image to the right). The top field, labeled "Drug/Pathogen," is also a search area. Data can be added to the table quickly by entering a search term. The search results update with each letter entered. This makes it possible to quickly filter down to the desired anti-infective or pathogen. It is easy to remove an individual anti-infective drug or pathogen from the table. 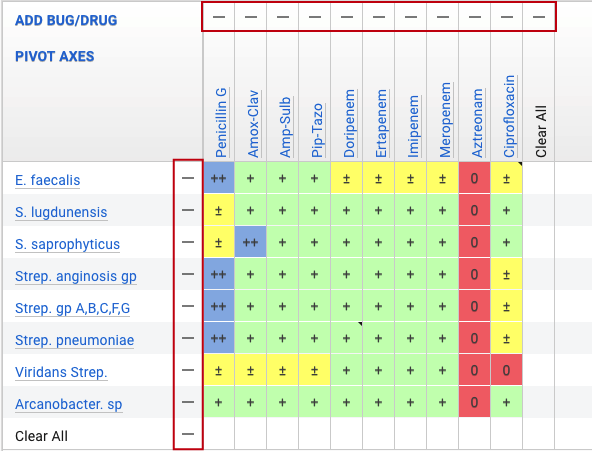 Each entry in the table has a minus symbol (shown within a red box in the image to the left). 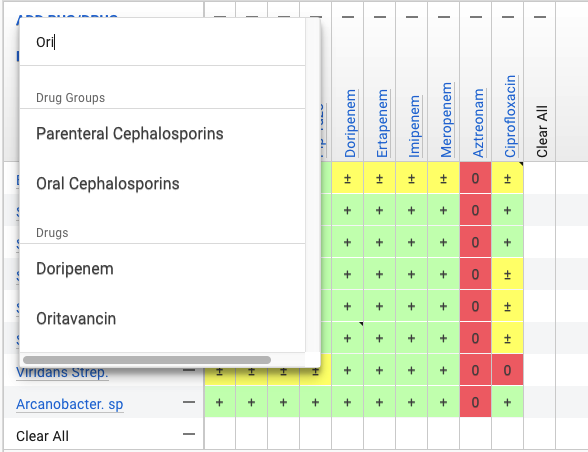 Clicking the minus symbol will remove the anti-infective or the pathogen from the table. You also have the ability to remove all of the anti-infective drugs or all of the pathogens from the table. Accidentally removed an entry? Not to worry, you can always add it back to the table using the "Add Bug/Drug" button.